My mother was Rebecca Mikell. She married Barkley C. Clifton, and her name became Rebecca Clifton. My mother passed on in 2004 at age 75. My mother was named after Rebecca Lee Mikell, my great grandmother, and my grandmother was Lula Cruz, who married Charlton Zachariah Mikell. My great neice is Rebecca Mikell, who was born Jan. 29, the same day as my sister, her grandmother, and me, her great uncle. I am the youngest and the lone male of Rebecca’s three children. I find this website very interesting and the result of the hard work of a few who care enough to connect the dots. I am 60, and my family history seems more important than ever before. Larry Clifton. Enjoyed your article about your great grandmother Rebecca Lee Mikell. So unique to have four family members born on the same day. Rebecca Lee Mikell was also my great grandmother and I am also named after her. Would like to let you know that your grandmother Lula and my grandmother Annie Leola “Ola” maiden name was Crews, not Cruz. They were the two Crews sisters married to two of the Mikell brothers, Charlton Zachariah “Zach” and Otis Willie “Ott”. Thanks for your comment. 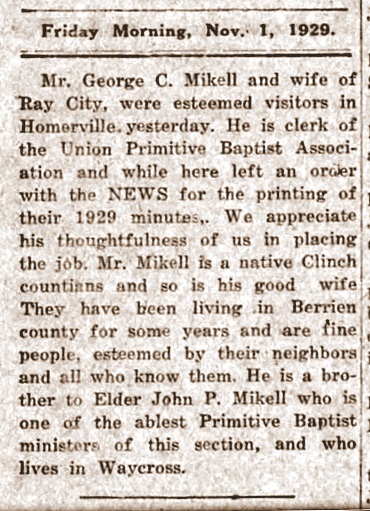 thank you for sharing this additional information about the Mikell family. I’m so glad that you are enjoying the blog posts. Hopefully we will have more on the Mikell family in upcoming posts. My name is Stephanie Cowart Mata, daughter of David Wayne Cowart and Martha W. Cowart and granddaughter of Caroline Mikell and Debuty William (Billy) Cowart. George Calhoun Mikell was great, great grandfather. I really appreciate the work that went into this. I have been researching my family lineage for some time, and I really am excited to be able to share this with my children. Thank you for sharing. I am the great grandson of George Calhoun Mikell. I would love to meet and build a relationship with my maternal family. I was 6 years old when my great grandfather passed but remember him suprisingly well. My mom (his grand-daughter) and my dad were married at his home in 1950. 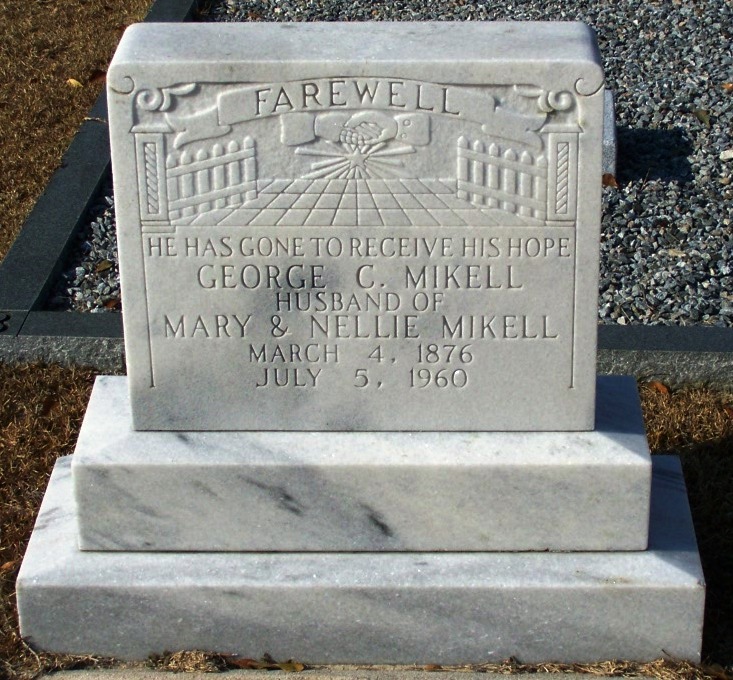 At that time the area he lived was referred to as Mikell Crossing. I vividly remember his 2nd wife whom we referred to as Aunt Nellie. I live in Valdosta and hope members of my family will make contact with me so we can plan to meet. My email address is waynecowart@mediacombb.net. I appreciate the editor of this blog more than words alone can express. 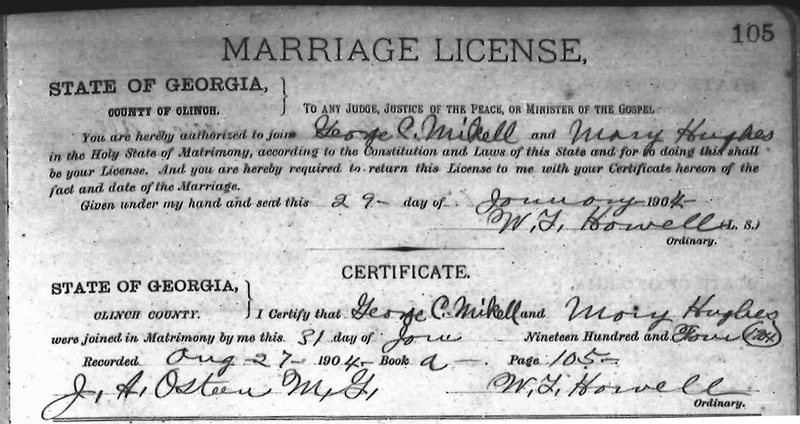 Having a copy of my Great Grandparents marriage license is something I’ll always treasure. I have an amusing story about Grand George, as I called him, that my family will enjoy hearing. It defines the purity of his character and personality.